This salad doesn't really have instructions, it's just a very simple recipe. I did use naan bread instead of pita, because I like it more, but use whatever you want. Soak 1/4 sliced red onion in cold water, 10 minutes; drain. Mix 2 tablespoons olive oil, 1 tablespoon chopped dill, and salt and pepper. Brush 2 pitas with some of the seasoned oil, then toss 2 cups cherry tomatoes in the rest. 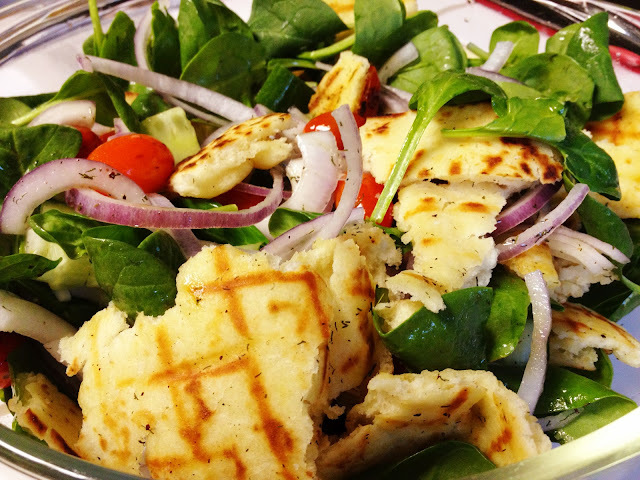 Cook the pitas in a grill pan until marked, then tear into pieces. Grill the tomatoes until marked. Toss the pita and tomatoes with 6 cups baby spinach, 1/4 sliced cucumber, 1/4 cup kalamata olives, the onion, 2 tablespoons olive oil, the juice of 1 lemon, 1/4 cup chopped dill, and salt and pepper.